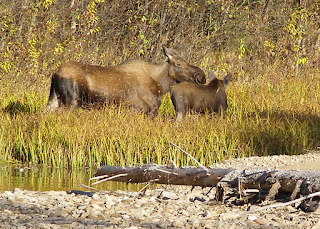 After our week of teaching we sought R&R at Chena Hot Springs north of Fairbanks, a great place for soaking in a naturally hot outdoor pool while moose and grizzlies lurk in the forest. 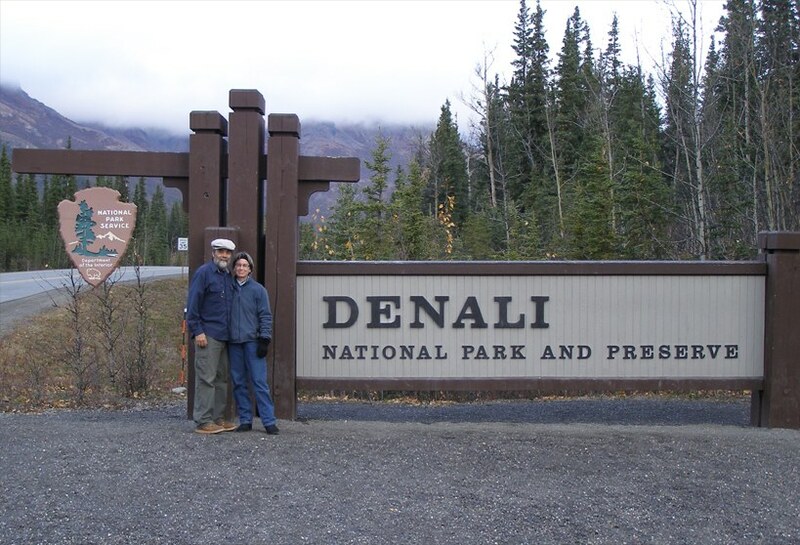 We then headed south to Denali National Park, location of the highest peak in North America, 20,320 foot Mt.McKinley/Denali. 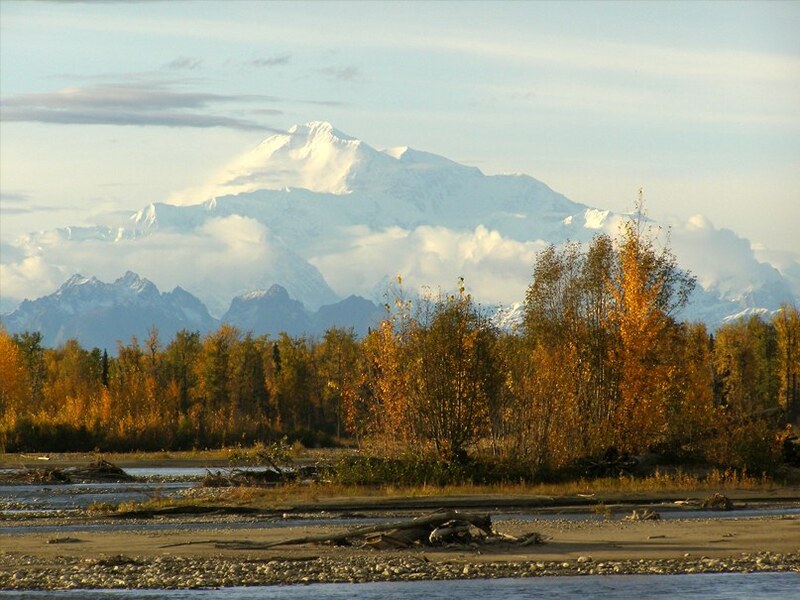 Officially named Mt.McKinley, the peak was originally called Denali, “The High One,” by native Athabascan speakers. Most Alaskans refer to it as Denali. On a clear day the huge mountain can be seen from Fairbanks, 200 miles away, and we did see it a couple of times while there. Now we wanted to see it up close. Denali NP officially closes September 15th but they keep one campground open, without water or t.p. in the outhouses, and allow vehicles to drive in the first 29 miles as long as the road is clear of snow. 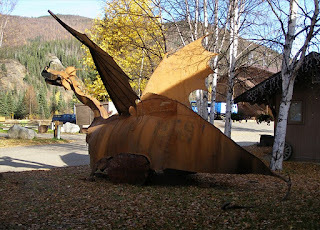 What a surprise to find Puff the Magic Dragon hiding in semi-retirement. the water for the hot springs. 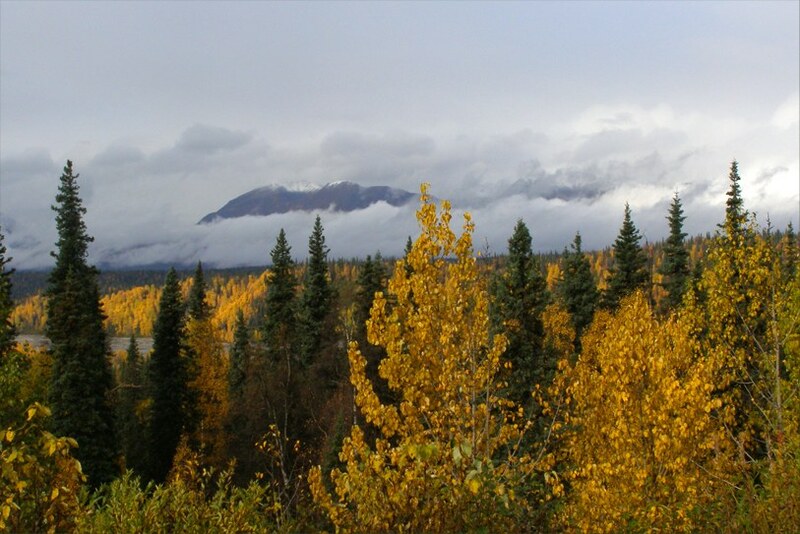 We have heard that only 30-40% of visitors to Denali NP ever see “The Mountain.” This is due to frequent cloud cover, especially during the summer months. We arrived on a stormy day and began the scenic drive into a quickly shifting, misty, cloud-wrapped array of dramatic mountain and valley landscape. Clouds parted to reveal a snowy peak lighted magically by the sun. It was not Denali but some other mountain of the Alaska Range. Sometimes stormy days such as this can be more beautiful than clear skies. 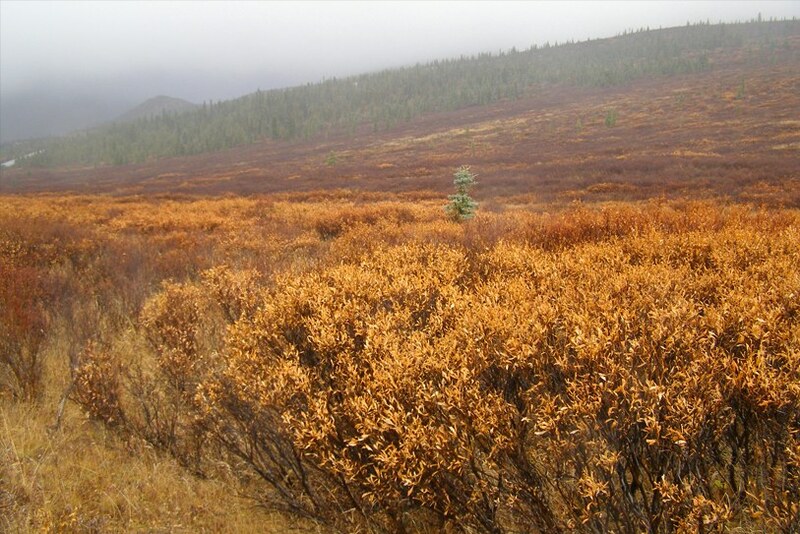 In the valley and lower slopes the colorful carpet of low-growing vegetation is a mix of dwarf birch, blueberry, a variety of willow species, fireweed, and higher up the slopes myriad highland plants including lichens and mosses. All were turning color as the days grew colder. 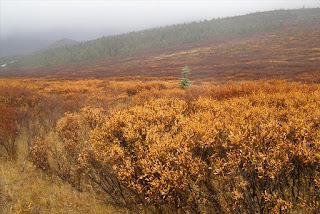 Now past their peak, autumn colors seemed enhanced by the fresh rain. The town began in 1896 as a trading post and riverboat supply base. It is now the jumping-off point for mountain climbing expeditions. The citizenry and overall feel of the place reminded us of Moab, Utah and Taos, New Mexico as they were in the 1970s. We saw lots of bearded men with dreadlocks and big dogs, burly mountain women and other assorted oddballs. In spite of its small population, Talkeetna has its own micro-brewery and NPR station, as well as a nice used bookstore and bead shop. 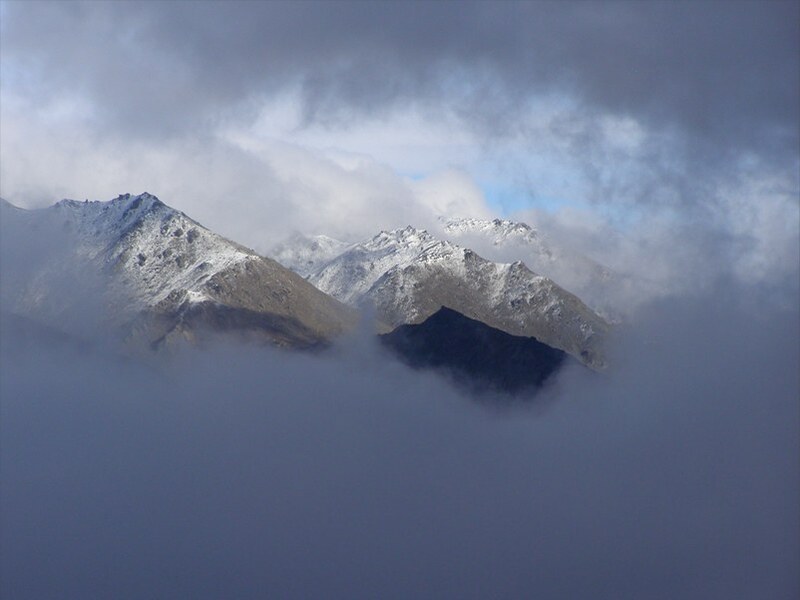 The next day we saw this vision of a humongous, glowing white mountain floating in the sky. This is Denali, much larger than we had imagined. 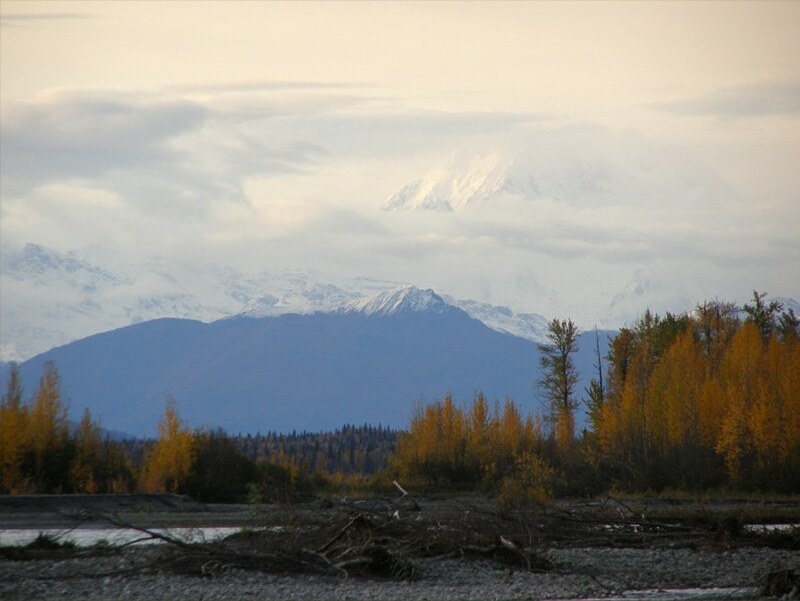 Denali’s 18,000 ft. vertical gain from its base is greater than that of Mt. Everest. It is truly breathtaking to see. We now understand why a sighting of this peak is the Holy Grail sought by park visitors. Later in the day the sky cleared a bit more and the peak revealed itself. with some of the local brew. 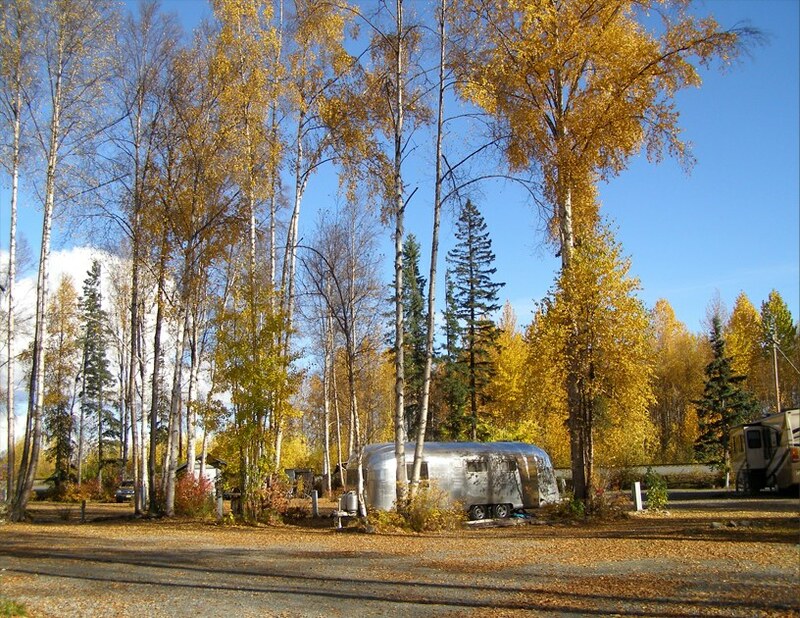 ﻿﻿During our stay in Fairbanks we lived with the Bears at North Pole, Alaska. These bears did not try to make a meal of us; instead they fed us generously everyday from their own supply of salmon, halibut, crab and moose meat. We were very grateful for their hospitality. 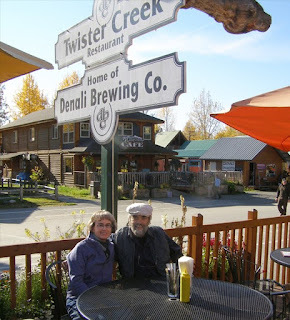 Tom & Betsy Bear of North Pole, Alaska and us, in their backyard. guns and ammo – they are ready to go. to feed three families for a year. A 54” trophy rack for son Chad. 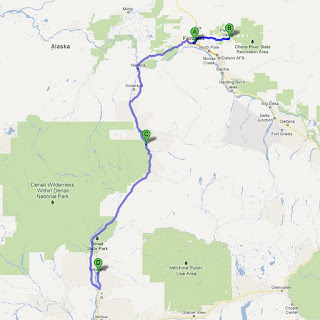 It was the opportunity to teach workshops in Fairbanks that got the whole concept of this Alaska adventure underway. Spike’s 5-day watercolor workshop for the Fairbanks Watercolor Society came together first, thanks to the efforts of Betsy Bear. 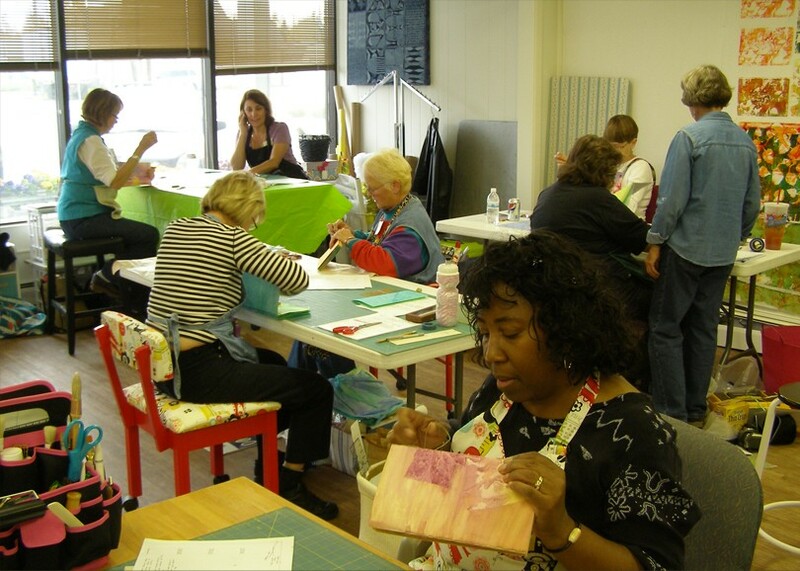 Betsy then put Sue in touch with Corlis Taylor, another Fairbanks artist, who gathered together a group for a 2-day book arts workshop. 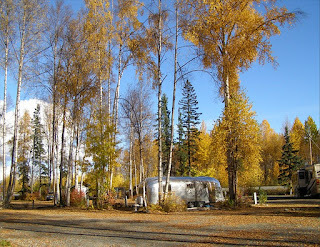 Our stay in Fairbanks focused on a full week of teaching, Spike’s workshop Monday through Friday, Sue’s on Saturday and Sunday. The plan for Spike’s workshop was to do a few demonstrations and some instruction indoors for a day or two, then spend time outside painting on location, weather permitting. 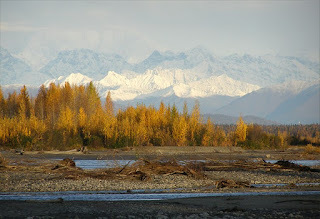 Being September, weather was unpredictable but autumn colors were gorgeous and sunny days would be pleasantly warm. 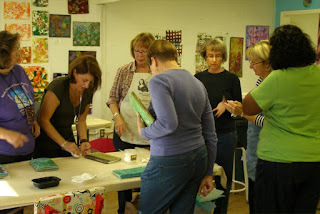 Workshop participants experienced a no-nonsense approach to painting with individual and group instruction. Four key points were covered: simple guidelines to a better composition - laying down a foundation quickly and confidently - simplifying shapes and understanding what you see - understanding the balance of warm and cool colors. For information about future workshops, visit Spike's workshop page. A demonstration mirror lets everyone watch Spike as he paints. 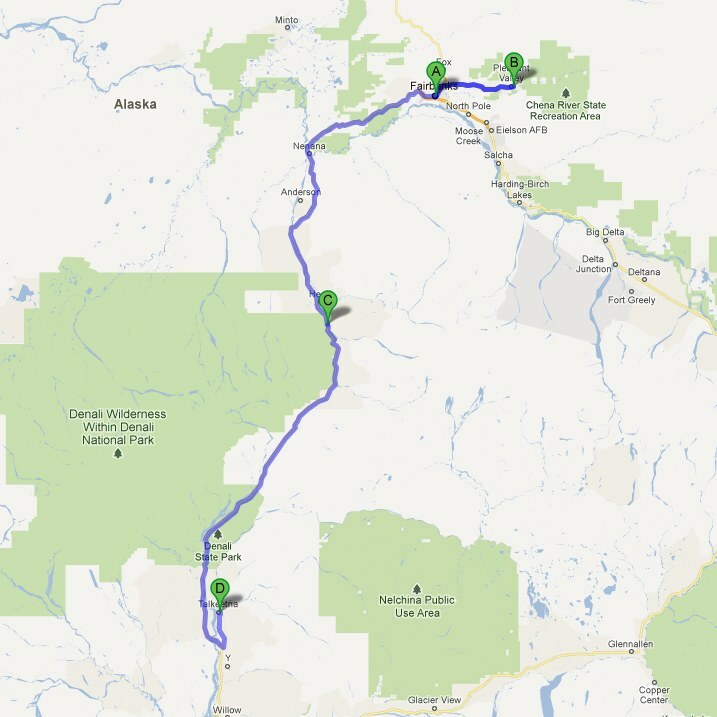 based on a photo we took along the Alaska Highway. After Spike’s demo, workshop participants attempted to paint the same scene. Everyone takes a look at Spike’s mobile studio set-up. 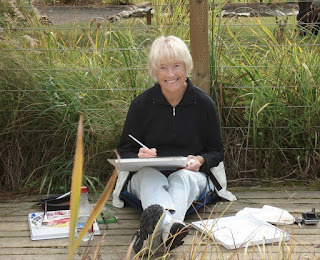 A beautiful day painting outdoors at the Georgeson Botanical Garden in Fairbanks. Gael sketches under a tree. Later Nelda was happily painting. Tom works on a masterpiece. Spike and Helen discuss composition. Tony, interrupted in his concentration. Thursday night we all brought food for a potluck feast. The workshop facility at St. Raphael Catholic Church was ideal with plenty of space, large widows for good light and a big kitchen. An evening of good food and great conversation. Drawing done by Spike during the outdoor session to demonstrate how important a composition sketch is so back in the studio the artist can complete a painting without photographic reference using only the sketch and one’s memory for color. A nice card from the appreciative group (accompanied by a gift of delicious smoked salmon and a bag of North Pole coffee beans.) 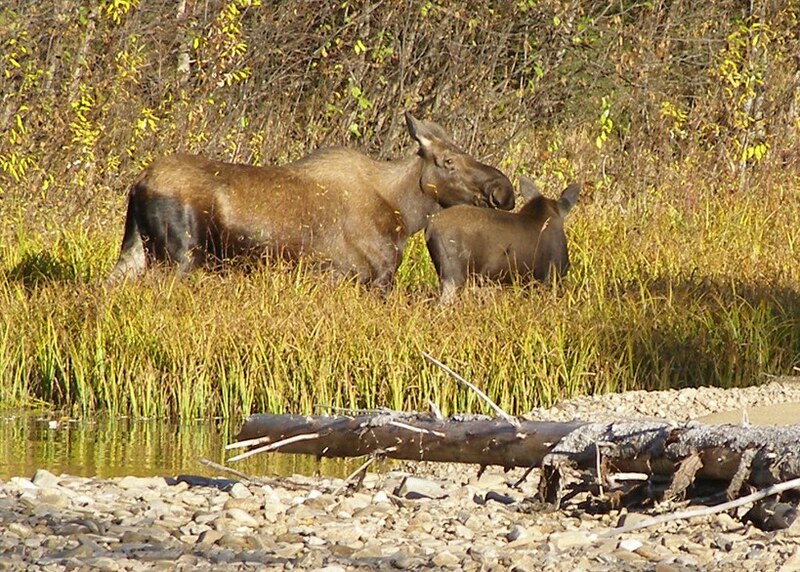 We love these friendly Alaskans. 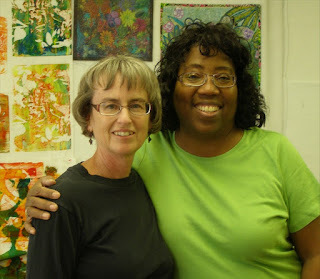 We had a wonderful time with the Fairbanks Watercolor Society gang. This was one of the nicest groups of people Spike has ever worked with. It was a great teaching experience for him. Sue’s workshop was titled The Spontaneous Book. The creation of this book begins with a full sheet of watercolor paper which is painted on both sides – spontaneously. It is then cut into pages which are sewn together. Binder’s board covers are attached with glue. The book is then ready to be developed into a unique work of art. The great thing about this approach is that you are no longer faced with a book full of blank pages. 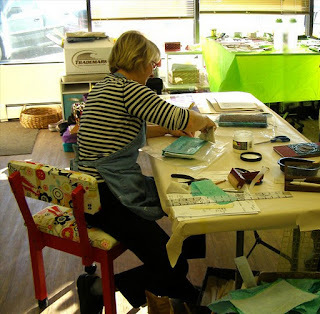 By the time you have gone through the painting and assembly process your pages have color and texture and your brain is fired-up with inspiration. and use of her studio space that made Sue’s workshop possible. With only two days to make our books the class worked quickly on the step-by-step process of painting, cutting, sewing pages and gluing on the cover boards. Once books were assembled everyone unleashed their own creative visions to work on covers and inside pages. 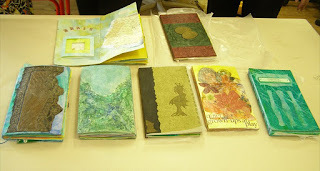 Much progress was made on these Spontaneous Books in the short time we had. It is hoped inspiration will continue as each artist works on their books, inside and out. 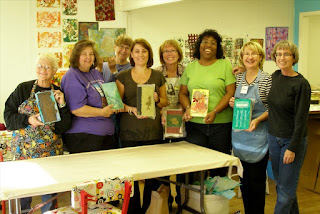 Left to right - Peggy, Sue, Janet, Timona, Linda, Corlis, DaLonna, Me. Everyone had fun and did a great job. Sue left the group with paper and boards for each one to make another book. She looks forward to seeing the results if anyone wants to send a photo or two.